Artist’s impression of the 41MW Templeborough Biomass Power Plant in Rotherham. Image courtesy of Templeborough Biomass Power Plant. The construction of the Templeborough Biomass Power Plant is expected to be completed in late-2016. Image courtesy of Templeborough Biomass Power Plant. The new 153t and 49m long bridge, spanning the River Don at the site, was lifted using a Liebherr LG1750 crane. Image courtesy of Templeborough Biomass Power Plant. 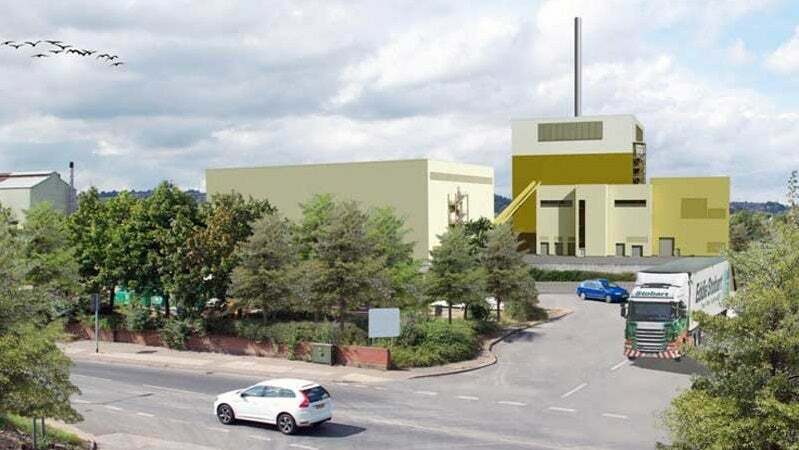 The Templeborough Biomass Power Plant (formerly known as the Brite Project) is being constructed within the Firth Rixson site on Sheffield Road, Templeborough, approximately 1.5km east of Rotherham, UK. The project is being developed by Templeborough Biomass Power Plant, a wholly owned subsidiary of Copenhagen Infrastructure Partners (CIP), who acquired the project from Brite Partnership North East in 2015. The required planning permissions for the project were granted by Rotherham Metropolitan Borough Council in April 2014, while the environment permit was granted by the Environment Agency in July that same year, and construction commenced in March 2015. The construction of the biomass power plant in the UK is estimated to require a £160m (approximately $237m) investment. The commissioning phase of the project is expected to start in late-2016 and operations are expected to begin in August 2017. The biomass-fuelled power plant will be capable of generating approximately 41MW of electricity, which will be sufficient to serve roughly 78,000 homes and offset 150,000t of CO2 emissions a year. The project is also expected to generate approximately 250 jobs during the construction phase. The Templeborough biomass power plant will primarily be equipped with feedstock storage and tabulator conveyor systems, Babcock & Wilcox Vølund multi-fuel boiler with a proprietary DynaGrate fuel combustion system and a dry flue gas desulfurisation (dry FGD) system, a steam turbine-generator, cooling towers, flue gas treatment tanks, stacks, and a fly ash silo. Other ancillary infrastructure will include a water treatment plant, a firefighting water building, a car park, a main electrical building, offices, and a control room. The plant will be capable of burning 264,000t/y of recycled waste wood, equivalent to 40 truckloads each day. The feedstock will be conveyed and burnt to heat water in the boiler, with the resulting steam used to drive a steam turbine-generator to generate electricity. The construction works for the project commenced with the partial demolition of an old steel plant at the site, followed by the installation of screw piles and laying of the foundations for the boiler building, which were completed in December 2015. The transmission cables installation also started in June 2015 and is expected to continue through 2016. The assembling and lifting of a new 153t and 49m-long bridge, to replace the old bridge spanning the River Don at the site, was completed in May 2016. The job was performed deploying a Liebherr LG1750 crane. The electrical output from the project will be conveyed to the Northern Power Grid electricity substation at Wincobank via an approximately 4.5km-long underground high-voltage (HV) transmission line. The feedstock for the power plant will be supplied by Stobart Biomass Products, a subsidiary of Stobart Group, under a long-term contract. "The construction of the biomass power plant in the UK is estimated to require a £160m (approximately $237m) investment." GDF SUEZ Energy UK has agreed to purchase the electricity generated from the project for 15 years. The chief contractor for the project is the consortium of Babcock & Wilcox Vølund, and Interserve. The former has also been contracted to provide long-term operations and maintenance (O&M) services for the plant. Saxlund has been contracted to supply the entire fuel feeding system for the project. The contract will involve the supply of a dual automatic fuel handling system with storage and conveyer lines to the boiler, and cranes. Reid Steel was involved with the assembling and lifting of the new bridge, working in collaboration with Moortown. Nayloy is supplying its proprietary Thermachem pipes, the flue gas treatment system will be supplied by Götaverken Miljö, whereas GBE and Gent have been contracted to supply and install the fire detection equipment and the thermal imaging cameras. Tubular Fabrications (TFL), Callidus Health and Safety, Tata Steel Projects, and Adesol are also involved in the project, with the latter two being involved with the design elements of the power plant. Fitchner Consulting Engineers is serving as the owner’s engineer. Other local contractors involved in the project are Braithwaite for the bulk excavation and remediation works, ESG for the site investigations and dewatering activities, Simplex for the piling and supply of concrete and bulk earthworks, Moortown for the groundworks, Ainscough for the supply of cranes and heavy lifts, Elland Steel for the supply of the steel frames, Barrier Architectural for cladding and roofing systems, and Plasticon for the water tanks. C*Blade Forging & Manufacturing specialises in the manufacturing of forged blades for thermal / nuclear steam turbines and forged compressor blades for gas turbines, for the power generation market.